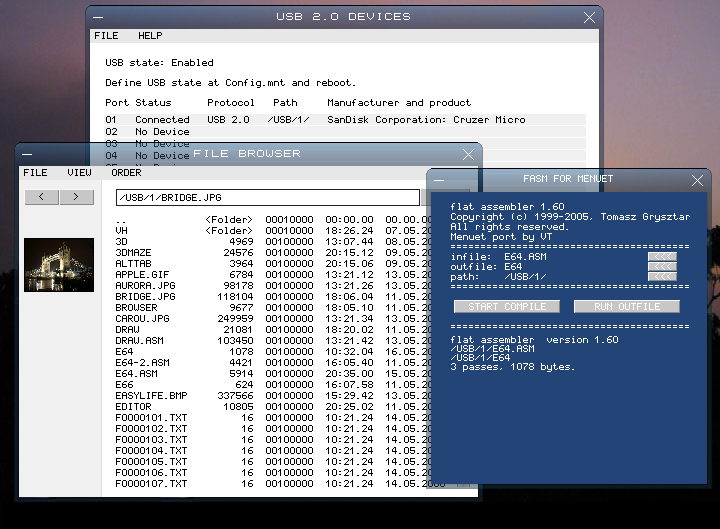 Menuet64 version 0.84 includes code for detecting USB 2.0 devices. I've used AMD / NVIDIA EHCI controllers for testing. USB mass storage support ( for eg. flash drives ) is likely to be included for 0.85. 0.85 includes support for mass storages. Devices use a large amount of manufacturer specific setups, so the support isn't yet complete. But atleast Sandisk flash drives should work just fine. That screenshot looks alot neater compared to 0.78. I still think the aliasing, and caption buttons need work. I would argue to have [move/resize][taskbar][window/max][close] as four buttons (I might be missing something, I don't use Menuet, just dev it a bit), and then a "fast corner" in the top right. You could just smash your mouse to the corner and click one of the buttons. Another thing to keep in mind is multi-touch and wii-mote devices. Put drivers for those on your OS before M$ and you'll have a slashdot hit. 0.85B includes USB 2.0 legacy disabling after bootup, Cache2USB and Alt+arrows/space mouse emulation. 0.85D - Changed mouse emulation to AltOption + arrows/space, which doesn't interfere with any application. i suggest you one thing. M is not located at the same place on all keyboards, but P is. Thanks for the suggestion edfed. I'll think about it. What is "altgr"? Is it the same as "Alt"? My keyboard has two ''Alt" keys, but no "altgr" key. On most (non us) keyboards the right alt is the "Alt Gr" key. Actually ... I know where the altgr key is, I was just trying to point out that not all keyboards have that key. In the same way that the M (and some other letters) shifts places, so does the altgr key depend upon the location of the store where the PC/keyboard was purchased. Support is based on USB video class and YUV422 protocol. Application sources at Menuet site. Saved AVI files can be viewed with Windows Media player or VLC. is there a possibility for a program to convert the 2D image in average 3D? then, drive motors to follow something with the cam/PC? and using the keyboard/mouse to pilot it? A professional one http://www.photomodeler.com/index.htm that I was very pleased with. Even though I tried only Lite edition (which is free and erm... lighter). 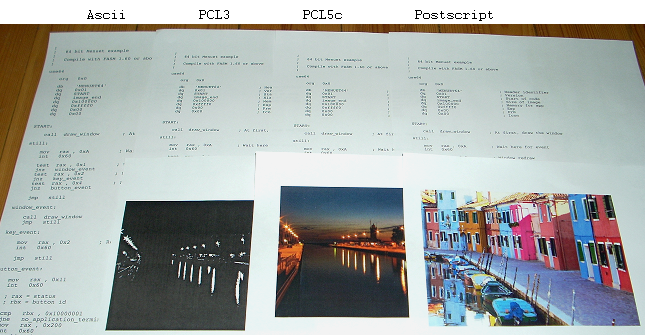 0.88B - Printer support with PCL3, PCL5c and Postscript.